After falling in love with Kanella earlier this year, it was hard to not notice the birth of the Varga Bar across the street. It opened in May and I finally got a chance to go check it out. It is literally across the street from Kanella. Lots of pinup shots and even pinup murals on the ceiling. There are a smattering of tables and booths inside, and while it’s still nice out, a decent amount of al fresco seating. It was coincidentally the last night of restaurant week, but we just decided to pick our own food. The menu itself is kind of slim, but there’s plenty of choose from. It’s actually quite simple, but the dishes have been swankified a bit. 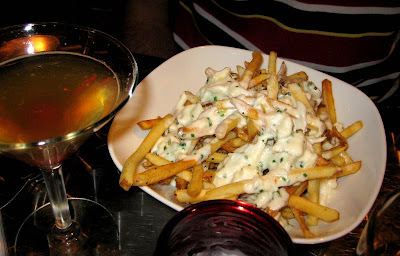 Like these crab cheese fries. A simple bowl of fries, but they throw crab on top! It was like a bowl of fries topped with crab chowder. It was brilliant. I’m going to start doing this on my own. They also have a large selection of beers and cocktails. This was one of the special sidecar cocktails. It was nice and strong, but it still doesn’t beat my favorite sidecar, at the Sidecar. Another example of how they swankify food. 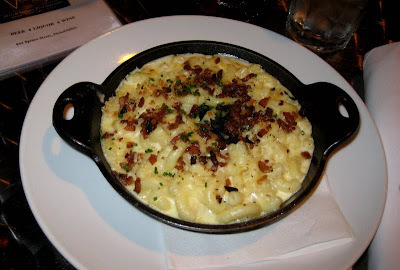 This is a little crock of mac and cheese, but it is made with gruyere, fontina, and mascarpone cheese, and topped with bacon and some bits of truffles. The bacon was a lovely touch. The truffles, not so much. Since my last experience with truffles (the truffle deviled eggs at supper) I realize that I’m just not into it. But it was still a good dish. 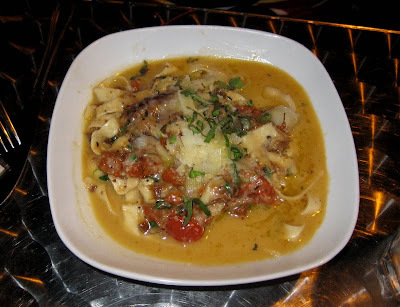 P got one of the specials of the evening – goat with pasta. He liked it, but it was not enough goat. I do have to say, the bowl was a little small, and probably way too small for a grown man. He cleaned his bowl and probably could have eaten a few more bowls of this. I wasn’t too hungry after the mac and cheese so I went with the kobe beef sliders. 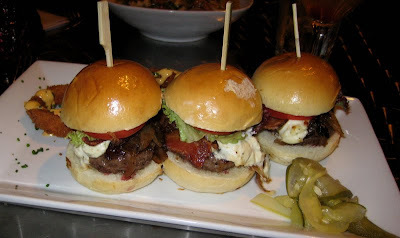 You get three adorable little sliders with bacon, shallots, vermont cheddar, tomatoes, and lettuce. I liked these (they just come cooked medium) but the buns were too thick and too dense. There was tons more bread than slider, so it was a bit too heavy on the bread side. It also came with really excellent onion rings on the side, and some pickle slivers. The service here was pretty good. The clientele here is nice and mixed . I think it’s a nice place to stop by for a drink if you are in the neighborhood. The food is pretty good, but nothing extraordinary. It’s a nice addition to the philly dining/drinking scene, but nothing to bowl you over. But I could probably see myself coming back here.